A variety of trends are driving service providers to consider advanced content delivery architectures that promise to ease the challenges of reaching new devices, improve system scalability, lower operational costs, and speed the launch of innovative services. The goal is to become more competitive in the video services marketplace; a market which is highly dynamic and features a host of emerging competitors. The consumer driven and technology trends that entice companies to enter the video services market also present opportunities for traditional service providers to increase their revenues and expand their subscriber base. Worldwide shipments of internet connected consumer electronics devices, a category including connected TV, video game consoles, Blu-ray players, and IP set-top boxes, will surge to 503.6 million units in 2013, up from 161 million in 2010. With projected shipments of tablet computers reaching 66.9 million units in 2011, an increase of more than 260 percent from the prior year, an unprecedented number of people now can access video services on-the-go. This enables consumers to extend the amount of time they spend watching video programming and provides operators with the opportunity to promote new revenue generating services to consumers. With revenue from DVD sales sliding approximately 40 percent from its peak and box office figures down 20 percent in 2011, content studios are looking at alternate ways to boost revenue. Studios have begun to release more content to VOD service providers to off-set declining revenues in other parts of their business. In addition, the success of services like Netflix and Amazon demonstrate that consumers will pay for increased content variety, generating interest in archived content libraries. In sum, storage expansion represents a challenge that will stress legacy VOD server architectures and present opportunities for tiered storage and content delivery networks. With increased competition in the optical networking, switch, and router markets, as well as improvements in technology, the cost of purchasing and deploying network equipment is coming down. This trend enables service providers to consider new content distribution and delivery architectures that rely more heavily on the availability of network resources and thus may have been considered cost prohibitive in the past. In addition, as the cost of pure IP delivery begins to approach that of RF/QAM delivery, operators are considering how they might accelerate the migration of services from RF frameworks to more flexible IP delivery models. Service providers are faced with a variety of challenges as they begin to compete in the multi-screen services arena. IP Video Traffic is both Incremental and Evolutionary The launch of multiscreen services is often seen as being incremental to traditional services. Adding the ability for a traditional TV subscriber to access the same programming and services they have become accustomed to on their TV on a tablet computer, smart phone, and gaming system is a good way to reduce subscriber churn and generate new revenue. Traditional set top boxes, while sufficient to address the needs of today’s customers, will become more burdensome over time as service providers work to address the competitive threat from internet rivals. Multiscreen delivery introduces a variety of challenges that service providers must be prepared to address. Unlike traditional VOD delivery to the TV, there is no standard content format associated with multiscreen delivery services. IP enabled consumer electronic devices support a wide range of video players, so multiscreen delivery solutions must be flexible enough to support different video players and content formats simultaneously. Given the number of formats required to support the full array of multiscreen devices, the process of transcoding, packaging, ingesting, storing, and managing each of the content formats can be difficult if managed independently. To deliver high quality video services over variable bandwidth networks such as those used in wireless communications, HTTP adaptive bit rate (ABR) technologies must be employed. HTTP ABR formats include multiple instances of the same video content encoded at different bit rate, resolution and frame rates (ex. low, medium, and high quality). Through communication with the various media players, a video server can dynamically adjust the playback of active sessions to ensure the appropriate content bit rate is streamed to the customer based on their available network bandwidth and device capability. The process is dynamic to account for changes in bandwidth and prevent interruption of the stream due to insufficient network capacity. Content delivery systems must account for the different methodologies and protocols used to manage content across each network. Traditional VOD architectures are generally based on a managed network framework where bandwidth is pre-allocated to a particular service and guaranteed for the duration of an interactive session. HTTP/OTT delivery environments are not managed and do not offer guaranteed bandwidth. These systems rely more heavily on buffering and dynamic bit rate controls in order to accommodate fluctuations in network availability. To support both frameworks, content delivery solutions must be able to operate within the framework of both managed and unmanaged networks and communicate based on the specific interface requirements of the various requesting systems, including clients, back office systems, advertising systems, asset managers, and monitoring systems. While service providers have traditionally focused on hosting and delivering content using their own private networks, new growth can be achieved by leveraging third party delivery networks. By engaging other service providers, negotiating peering relationships, and federating CDNs, operators can offer their video services to subscribers beyond of the reach of their own private networks. By adding “over the top” delivery to their own privately hosted services, MSOs and telcos can diminish the perceived value of competitive internet based services. Enabling components within the private content delivery network to flexibly interact with components on third party networks is critical to supporting an open, scalable, and extensible system that can address future needs. Service providers preparing to invest in their own content delivery networks are faced with the question of whether to build a solution exclusively to address new IP enabled connected devices or to extend the CDN design to include traditional set-top boxes. While isolating the content delivery network to focus only on new connected devices is a seemingly quick path towards an initial deployment, it does not address the business challenges operators will face over the next decade. Operators have made heavy investments in traditional set-tops, TV-VOD servers, and related RF infrastructure, investing billions of dollars each year for the past 10 years. There are 160 million set-top boxes deployed in the U.S. alone and it is unclear how long it will take operators to transition their existing subscribers from traditional STBs to IP technologies such as in-home gateways, IP set-tops, and connected televisions. The pace of conversion will be gated by the RF to IP conversion costs, which will include the purchase of new network components and customer premise equipment, as well as the labor required to swap out existing equipment. As internet-based delivery becomes a more viable for premium video content, new technologies are emerging to address the needs of content and service providers. These include HTTP adaptive bitrate content formats promising a better quality of experience for internet video consumers, DRM to protect content over public networks, advanced video players in support of new consumer electronic devices, and new elements such as HTML5 video. As new technologies are introduced to serve a growing array of consumer electronics devices, the formula for delivering content becomes more and more complicated. Content delivery networks are tasked with managing the complexities and by applying some intelligence to the process, CDNs can become more efficient. The following content workflow solutions can be integrated into the CDN in order to simplify the multi-screen delivery process. Transmuxing enables a single content format to be converted on-demand to a different content format based on a subscriber playback request. This process differs from transcoding in that the underlying video codec is not changed during the process. When a customer request is received for a content format that is not natively available, transmuxing software can identify an alternate source format, de-containerize the source asset, and apply a new container to the underlying video codec to make it appropriate for the requesting device. Since transmuxing software does not alter the video codec, it requires much less processing power than transcoding and can scale to support thousands of connections within a single server. Introducing transmuxing into a CDN framework can simplify the content management process by enabling operators to ingest and maintain a single source format on their content delivery network. The complexities of delivering video to multiple devices, including format conversion, are left to the CDN. Infusing transmuxing features deeper into CDN networks can result in significant bandwidth savings on the IP backbone since fewer content variants will need to traverse the network. For example, if three consumers each request the same video asset on different devices, one requiring MS Smooth Streaming, one requiring Apple HLS, and one requiring Adobe HDS, only a single file format will need to be pulled across the network in order to fulfill the need if transmuxing is enabled on the edge delivery server. The edge delivery server will fulfill the first request using the native content format. The two subsequent requests will be fulfilled by dynamically repackaging the native content format into the two other requested formats. Using this example, a CDN solution with embedded transmuxing will consume 66 percent less network bandwidth on the IP backbone than a CDN solution that does not include integrated transmuxing. 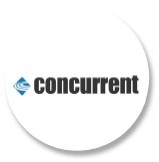 Concurrent offers the MediaHawk VX unified content delivery solution for service providers interested in building their own content delivery networks. By converging features from our flagship VOD product, MediaHawk™ VX, with our recently announced eFactor™ product suite for HTTP delivery, Concurrent has created a solutions that simplify the migration of services from traditional frameworks towards a pure IP model. Concurrent’s CDN solutions include integrated content workflow capabilities, which reduce the complexities of delivering multi-screen video and ultimately provides the foundation to enable service providers to deliver on the promise of any screen world.